Gunybi Ganambarr - 'Buyku' (2011) by the remarkable Gunybi Ganambarr from Yirrkala in NE Arnhemland; not on bark but incised into and painted on to laminate board from a 25 year old community house. A gift of eight Aboriginal artworks to the prestigious Metropolitan Museum of Art in New York has been hailed by its Director as “introducing a dynamic new dimension to The Met's global representation of contemporary art”. Wow! Arguably, this development is part of a growing enthusiasm in America for Indigenous Australia's cultures – something the Aboriginal Art Directory has been noting for a year or so now. And key to that process has been the collecting couple, Margaret Levi and Robert (Bob) Kaplan, the Seattle-based team that has built a really serious collection partly as a result of Levi teaching at both ANU and Sydney University's American Studies Centre over a number of years. Seattle Art Museum has been sucked into their orbit, accepting gifts, showing Aboriginal art on a regular basis and putting on a major exhibition based on their collection a year or so ago. That collection – carrying the grand title of Ancestral Modern: Australian Aboriginal Art from the Kaplan & Levi Collection - will begin a three or four venue tour of the US next year under the aegis of curator Pamela McClusky from Seattle. And that process of educating US-based curators is all part of the Kaplan/Levi plan. The Met dipped its toes tentatively into Aboriginal art back in 2009 with a 6-month showing of a number of canvases – though Kaplan and Levi suggest that this was primarily a way of exposing them on those prestigious walls prior to offering them for sale. It didn't lead to anything substantive at The Met, though, this has only come about as a result of much charming and encouraging of curators in both the Africa, Oceania and the Americas Department and the Department of Modern and Contemporary Art. Sheena Wagstaff heads the latter with a mission to lift The Met's eyes beyond the Western and Chinese contemporary art canon. And the former department features Maia Nuku, who is of Maori and English ancestry and is an expert on Polynesian gods and idols, which bodes well for New Zealand and the art of the Torres Strait as well as Aboriginal. Thomas P Campbell is also a recent arrival as Director of The Met with a mission to break down specialist silos in the museum. The Kaplan and Levi team captured his interest on a visit to Seattle, taking him on a persuasive tour of their home gallery. The selection of the eight works was up to The Met – though Seattle Art Museum's 150 were off-limits, and they do include all of their John Mawurndjul barks. Not that barks are yet on The Met's radar – that shaggy woodwork is still just too ethnographic for a contemporary art setting, it seems. 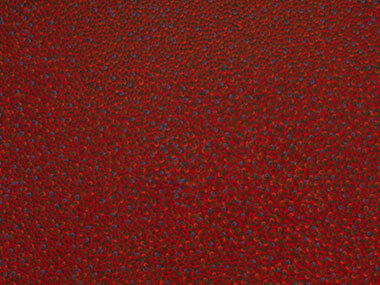 On the other hand, a rare secondary market buy for the Collection – Ena Gimme Nungurrayi's 1991 work 'Martuwarra', a relatively early work from Balgo Hills – with an intensely detailed story-line attached, linking Country and natural food sources from her childhood – was an early “must-have” for the Museum. Women dominate its selection: two Kathleen Petyarres, a stunning Dorothy Napangardi which stood out on loan to the recent Harvard Art Museums Aboriginal show, works by Doreen Reid Nakamarra, Lena Nyadbi and the youthful Abie Loy Kemarre, and the only male, the radical Yolgnu Gunybi Ganambarr with a work, not on bark, but on a 'found' laminate board. It's not yet known how the works will be presented – probably not as a group, but integrated into contemporary hangs when appropriate – both shows of abstraction and contemporary spirituality spring to mind. And that's just how the Tate Modern in London intends to use its recently announced joint purchase with Sydney's Museum of Contemporary Art of contemporary Oz art. Ironically, the first tranche of about 15 selections, funded by a Qantas grant, was preponderantly of urban Aboriginal art. But will The Met tell a story like Ena Gimme's? They tried with the 2009 canvases. But in a Department of Modern and Contemporary Art, perhaps they'll mistakenly be resistant to myth, geography and spirituality. So, is America an even more exciting place to be than Australia in its current appreciation of Aboriginal art? With institutional shows in Harvard and Washington, two or three US collections touring around the place at any one time, a commercial show of Warlimpirrnga Tjapaltjarri selling out in New York and now The Met imprimatur, it certainly looks good. Margaret Levi admits, “It's more exciting than it's ever been in the US, but still not as exciting as Australia. Everyone touts 1988 as excitement central – the big 'Dreamings' show in New York, which kicked off the 3Ks - Messers Kluge, Kalton and Khan (with Kaplan a distant fourth!) - into putting together significant Indigenous collections. But it really didn't catch on around the country then. Now, particularly with Debra and Dennis Scholl's high-quality collection going around serious contemporary institutions, it's helped us and built so much credibility. But I wouldn't describe the commercial side of it – which really comes down to two brave women, Julie Harvey and Nan Booker – as vibrant currently”. Meanwhile at Cornell University, where the Scholl Collection has come to rest, a critical response came with, “The main reservation that I have here concerns the paint application, which is mostly rudimentary. The method seems closer to the self-taught “outsider” artists within modern cultures than to the mid-century abstractionists these works also evoke. Still, it’s possible to do interesting things with limited technique”; damning with faint praise. But isn't that the whole point – this art is significant just because the artists are inventing their own language of paint, not just imitating the Western art world. Bob Kaplan and Margaret Levi's Collection has been hailed by the Frist Center in Nashville where 'Ancestral Modern' will launch next June as, “developed over many years of travel and research and is the pre-eminent collection of Australian Aboriginal art in the United States”. “We don't see it as a competition”, insists Levi. “We just wanted to build a quality collection and educate the American contemporary art scene to the point where it could end up in major institutions”. Young Abie Loy Kemarre's 'Bush Hen Dreaming' (2003). 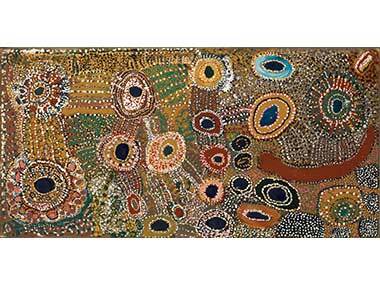 Ena Gimme Nungurrayi's 'Martuwarra' (1991), painted just a year before she died in remote Balgo Hills/Wirrimanu. 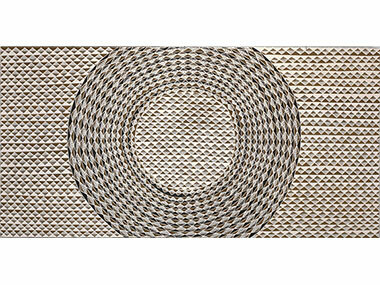 It reflects the importance of childhood memories of her mother's Martu Country for her.